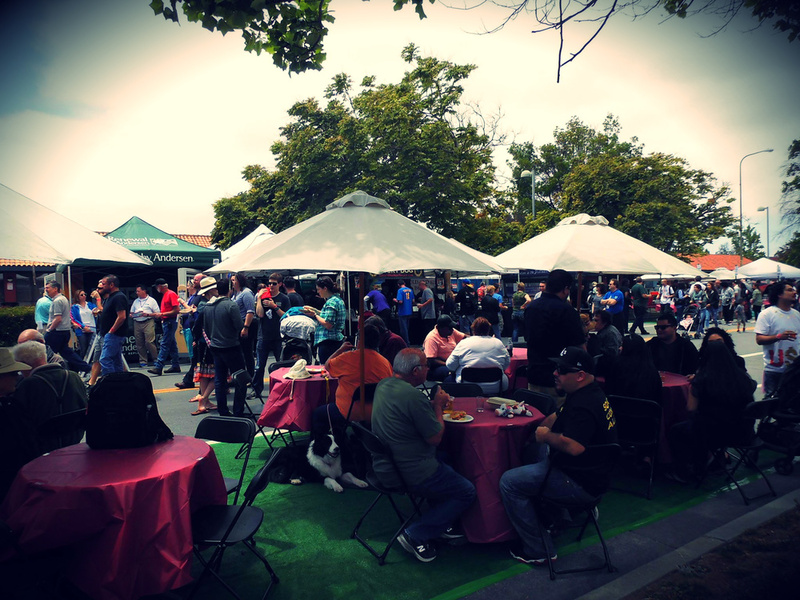 Fremont’s city hub closed it’s street to celebrate local cuisines and California craft brews. For $35, guests were allotted ten 5-ounce tasting pours — that’s 50 ounces of brewski! 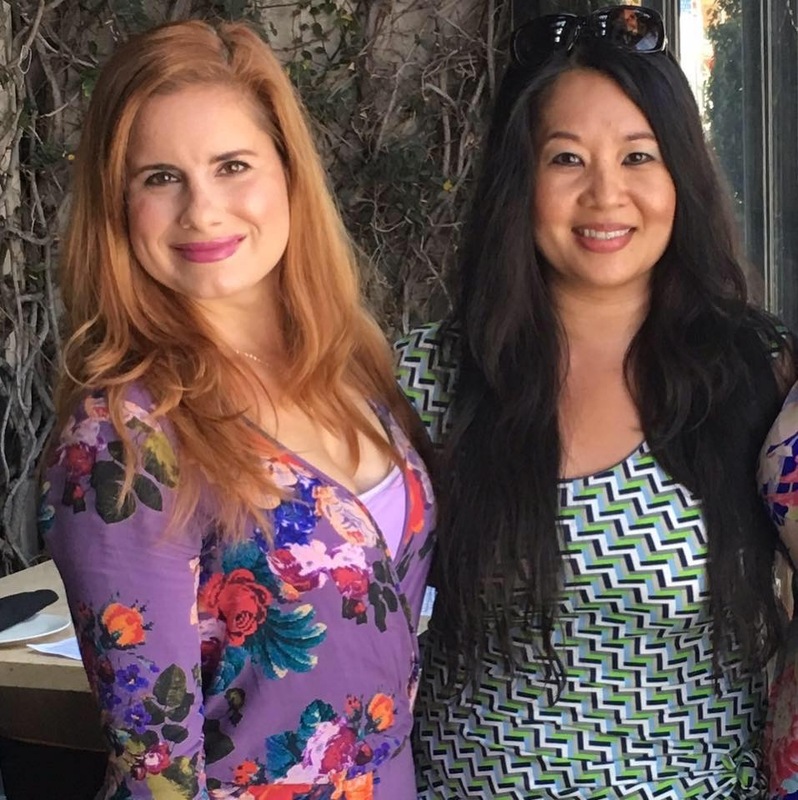 — and with reps presenting anywhere between 2 to 8 beers each, there was something to please every palate. Now, I’m not going to lie to you; I’m a bit of a lightweight when it comes to beers. But, like I said, with so many options at the Brew Fest, I knew I was bound to find something to appease my picky tastebuds. So I got the ball rolling with a few light lagers. 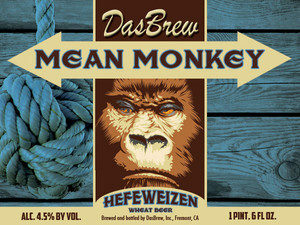 Das Brew’s Mean Monkey Hefeweizen (4.5% ABV, 15 IVU), a nice pale wheat-based ale, had enough body to feel like I was drinking a real beer, but the delicious hints of fruit and spice balanced out the yeast perfectly, it was super refreshing for a nice summer day. probably the lightest of all the beers I tasted, and I’m not complaining. 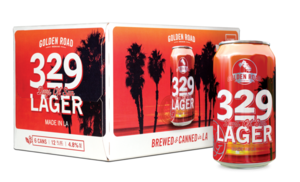 329’s taste was so subtle and the finish so crisp and clean, it could perfectly pair well with any meal — not just burgers. But, when you’re at a beer tasting, it would be a waste not to go out of your comfort zone a little. And I couldn’t resist trying a few more unusual offerings. Especially when the rep from Stone Brewing Co. mentioned a “lemon-zesty” beer. 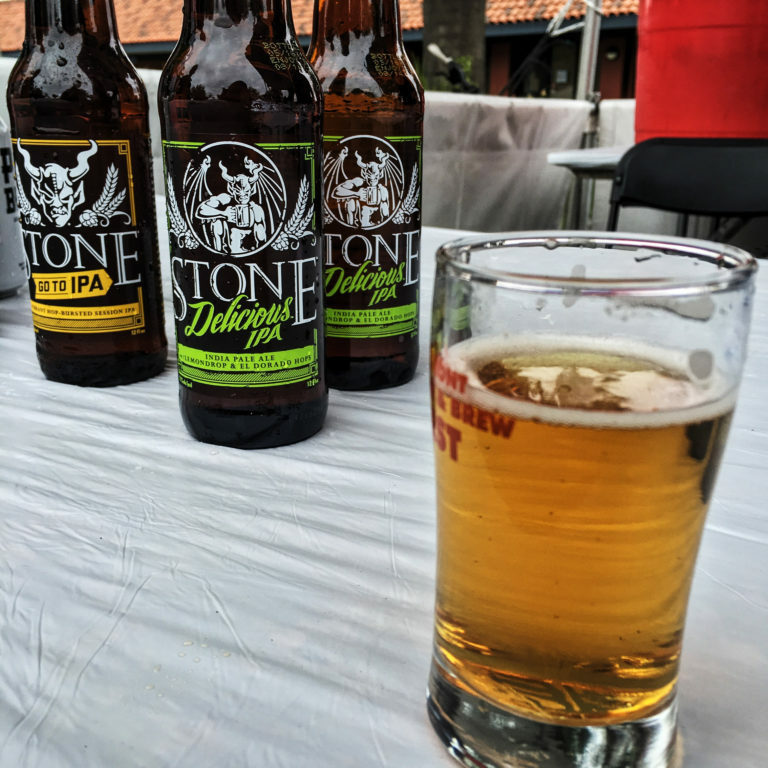 Stone Delicious, an Indian pale ale (7.7% ABV, 75 IBU) is, indeed, a simultaneously citrusy yet bitter beer. The brewery combines Lemondrop and El Dorado hops to add a bit of sweet to the hop spice. 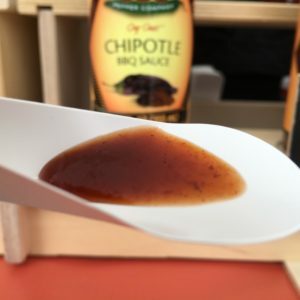 A crazy concoction that just actually works — ideal for anyone looking for something outside the box. Speakeasy’s Prohibition Ale (6.1% ABV, 50 IBU) was probably by far my favorite beer that I tasted that day. With its red-amber coloring, it just looks beautiful. Good news: it tastes beautiful as well. 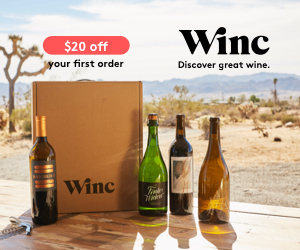 Like I said, I’m not, by any means, a beer aficionado, my palate is more attuned to picking out the flavors in a complex wine. Well, this ale is perfect for anyone like that. Right as it’s poured, you can smell citrus fruits, oak, spice, and a hint of caramel. When I tasted it, I felt like I was drinking a beautiful bouquet of autumn fruits in a pinewood forest. 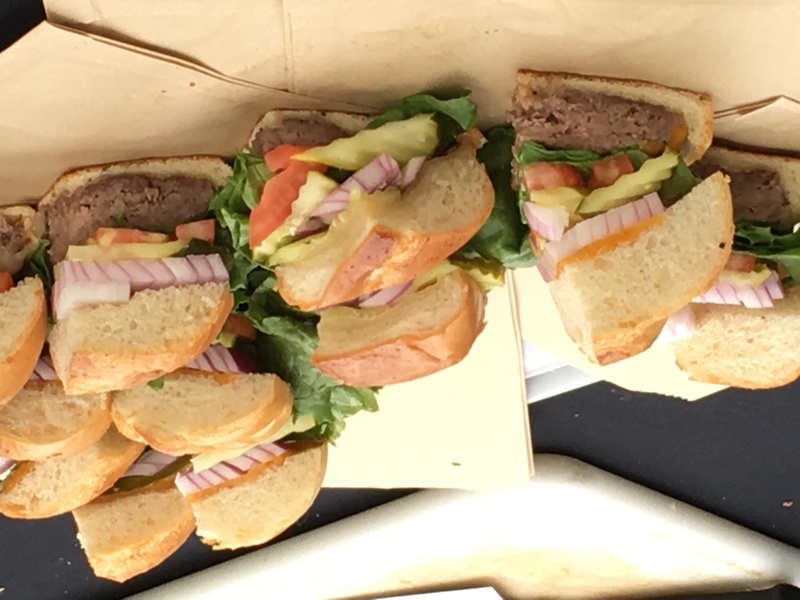 The event provided tons of options from local shops, food trucks, and good old stand-bys like The Counter and Whole Foods. 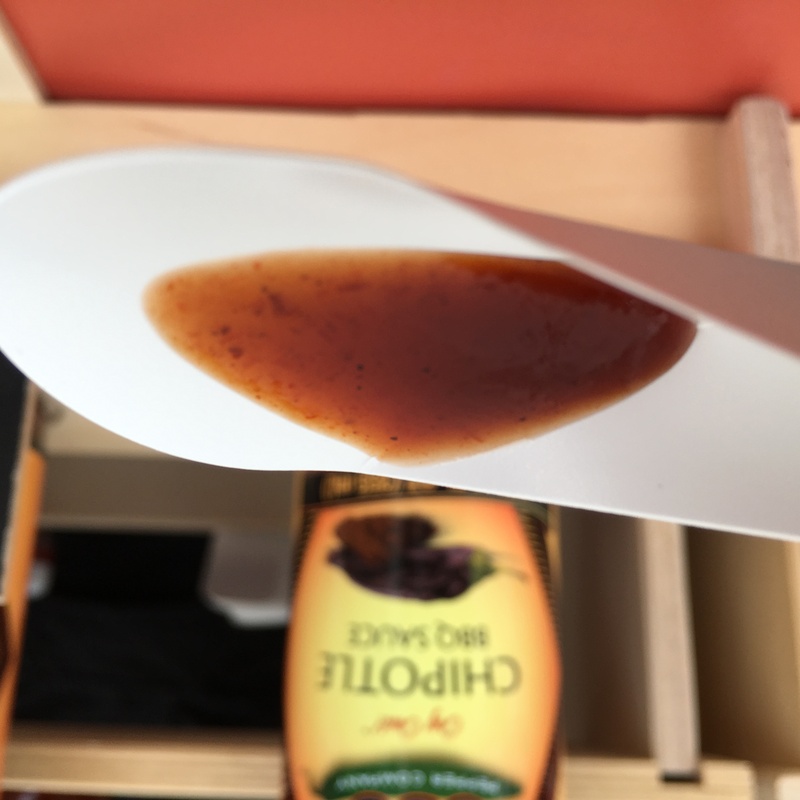 There were also quite a few local vendors providing samples of their sauces, marinades, and BBQ rubs. 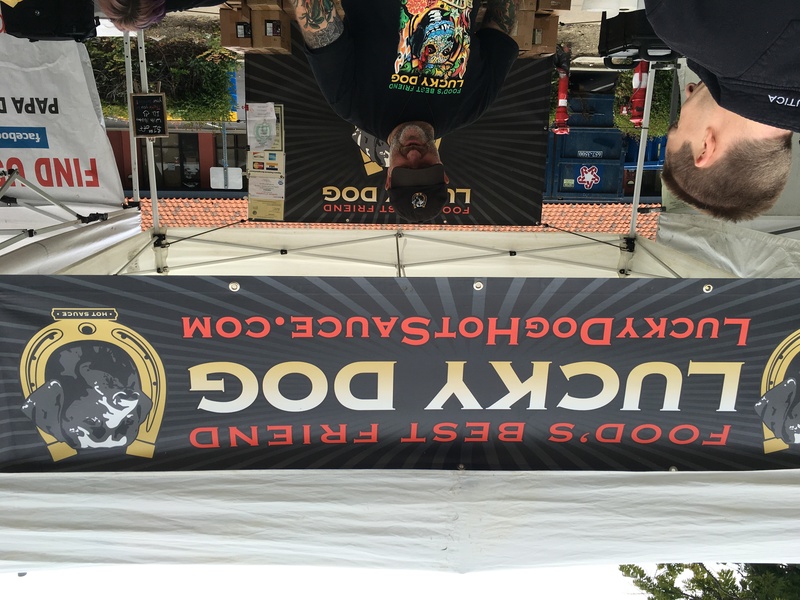 Lucky Dog Hot Sauce — he finally convinced me to try his top 3 most mild sauces! 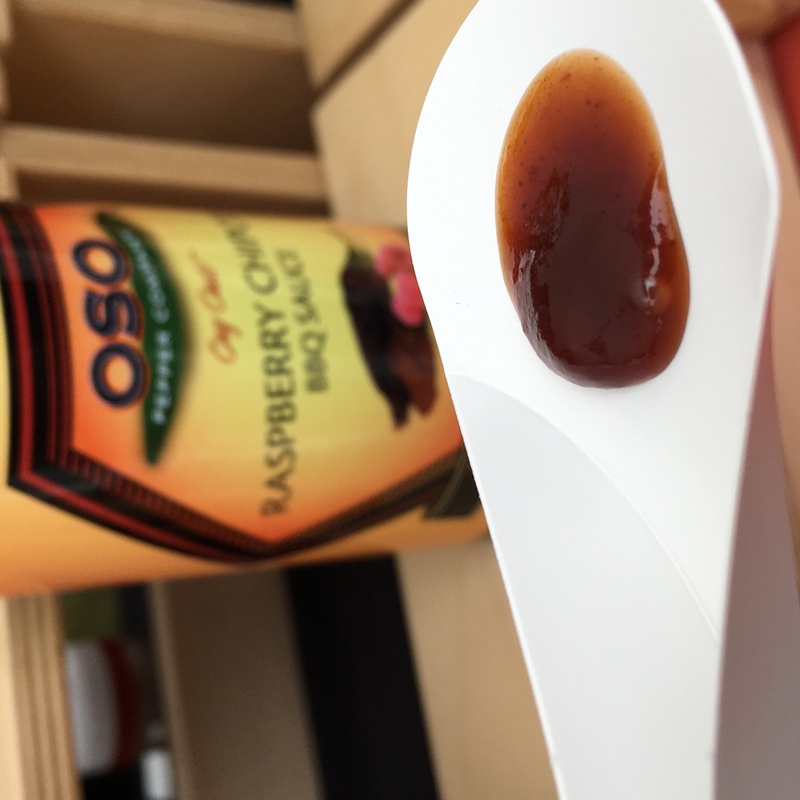 OSO Pepper Company Chipotle BBQ sauce sample. Deliciously smokey with a kick of an aftertaste! 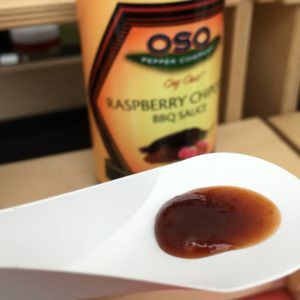 OSO Pepper Company Raspberry Chipotle BBQ Sauce. 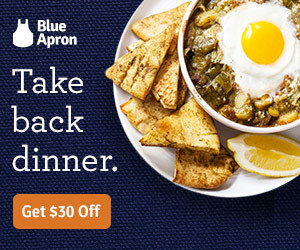 Adds a little sweet to your spicy! 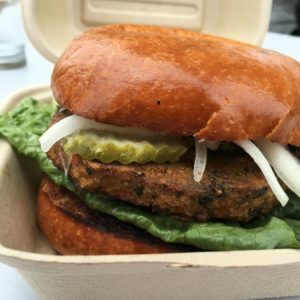 Of course, when all is said and done, I couldn’t pass up a good veggie burger for lunch. 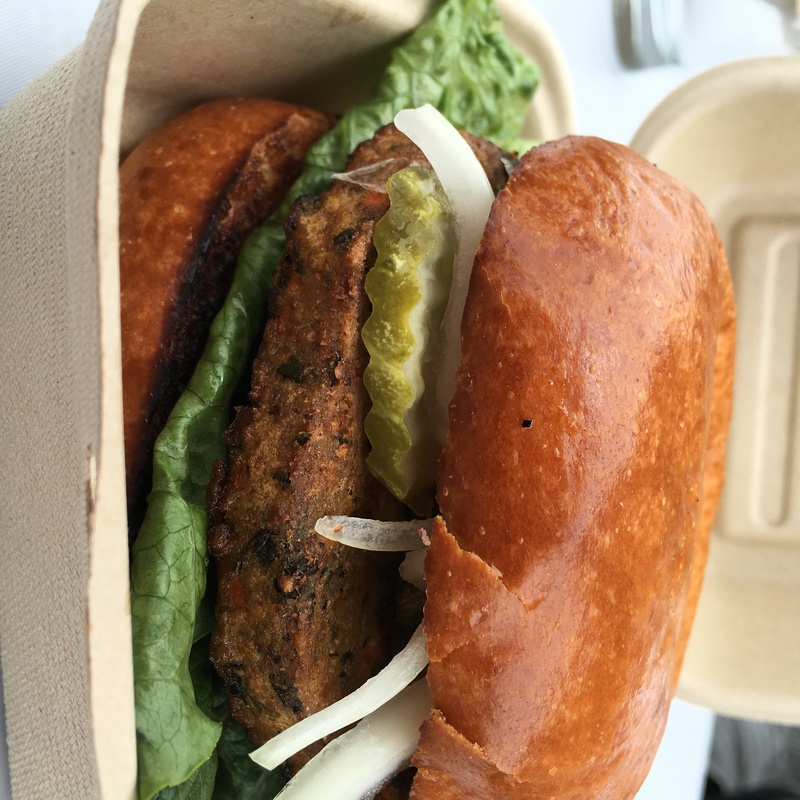 So I hit up Capello’s Barbecue food truck for a deliciously house-made veg burger. 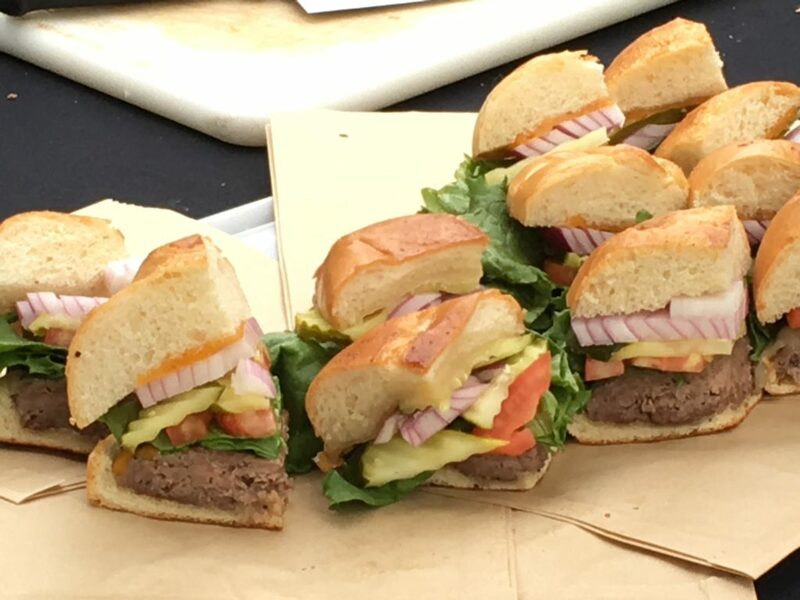 To me, what makes a great meat alternative patty is when you can see the vegetables. Carrots, broccoli, even walnuts — they were all there in this amazingly fresh burger. The day was a success. 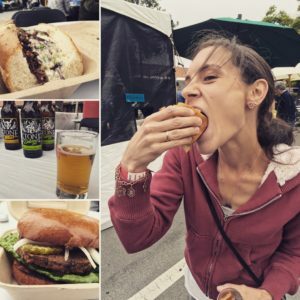 I got to try some new brews, get my tongue blasted by hot sauce, and left with a belly full of burger. Thanks, Fremont!